Today, 3D printing is a niche technology that most people won't have any first-hand experience of, but that's going to change in the coming years: from medical surgeries to space travel, 3D printing (also known as additive manufacturing) is set to have a huge impact on the way we live. To get you caught up quickly on the state of 3D printing and the kind of effects it can have, we've compiled ten brief points to note about this emerging technology. 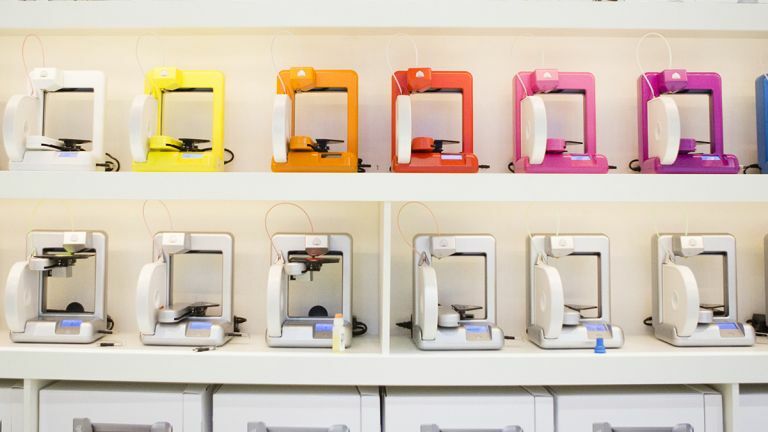 Once you've read through this primer you're all set for the 3D printing future. You can buy your own 3D printer for your desk for around £500 or so, though at that end of the market you're pretty limited in terms of the size of the objects you can use and the materials involved. More capable 3D printers are available for a few thousand pounds, which isn't completely unaffordable - and prices are falling all the time. If you're using the budget printers we just mentioned then you're limited to smaller items and one or two materials, but in the long term these devices will become more and more capable: goods and parts won't need to be shipped from one end of the country to another, because they can be printed on-site, with designs sent across the world in seconds. Most 3D printers use some type of plastic to bring designs to life, but there are many other materials being used: including edible food. The Foodini from Natural Machines is one device capable of producing everything from pizzas to cookies, all using fresh ingredients prepared before printing. In the not-too-distant future you could be getting both your meals and your cutlery from a 3D printer. Healthcare is one of the areas where 3D printing is really taking off - it enables doctors and surgeons to create custom splints and body part replacements that are individually tailored to each patient rather than produced en masse. It can also help surgeons to plan operations in advance in ways that wouldn't otherwise be possible. Several 3D-printed housing projects are already underway in places such as China and the Netherlands. Sure, these houses are basic in terms of layout and materials, but imagine the difference they could make in a disaster zone or in areas where large numbers of displaced people need shelter. As with all other aspects of 3D printing, the technology will quickly improve in the coming years. 3D printing isn't as new as you might think. The earliest additive manufacturing devices and materials were developed during the 1980s, with laser cutting, plastic firing and photo curing all considered as potential routes forward for the technology. Charles Hull, one of the early pioneers, is the founder of 3D Systems Corporation - the company launched its first printer in 1987. We've mentioned how 3D printing can change manufacturing thanks to the way designs can be emailed around the world, but that applies to space travel too. Imagine a colony on Mars that can 3D print its own living pods, or a spaceship that's able to 3D print its own replacement parts with designs sent from ground control - the story of Apollo 13 would've played out very differently with a 3D printer on board. A lot of the good that 3D printing does will never get to be seen by consumers or end users: for example, it enables manufacturers to quickly prototype and refine ideas without having to waste a lot of time and materials on designs that may not work. It also gives smaller businesses and teams more scope in experimenting with ideas. Like any other kind of technology, 3D printing can be used for foul means as well as fair. A 3D-printed gun, for example, is very difficult to trace if you're manufacturing it in your own home, and then there's the problem of copyright - one day the design of your smartphone might be as easy to download and replicate as the latest movies or music are to pirate. There are various different types of 3D printing technologies to know about, with variations in the types of material used to make the layers and the ways those layers are created. Metal alloys, thermoplastics and ceramics are the most commonly used materials, but advancements are being made all the time.